Filtering by Category: "Mexico Motorcycle Touring"
Guanajuato, Mexico is one of the great cities in Mexico and makes for a great ride. They really just wanted to see the bikes! Sure, I know the way! Follow me! 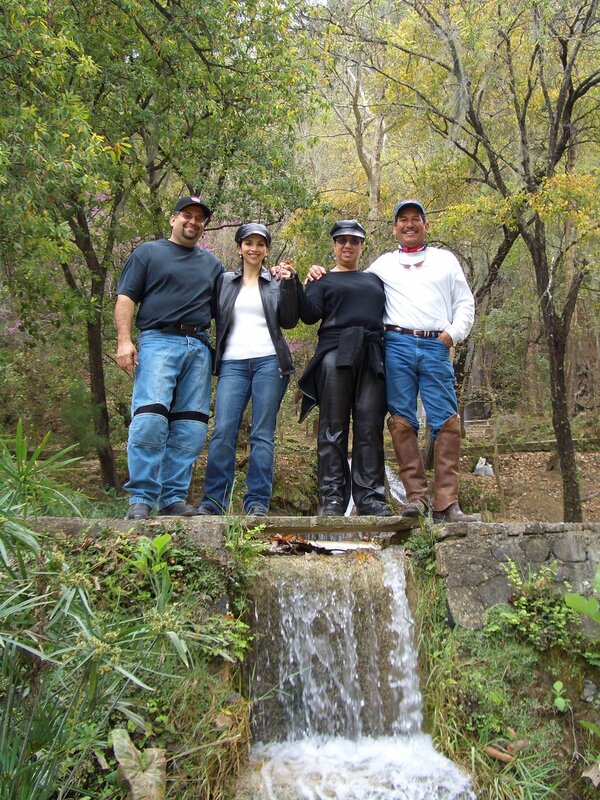 categories "Mexico Motorcycle Touring", "Touring"
Galeana is a medium sized city located in the state of Nuevo Leon and about 200 kilometers south of Monterrey. 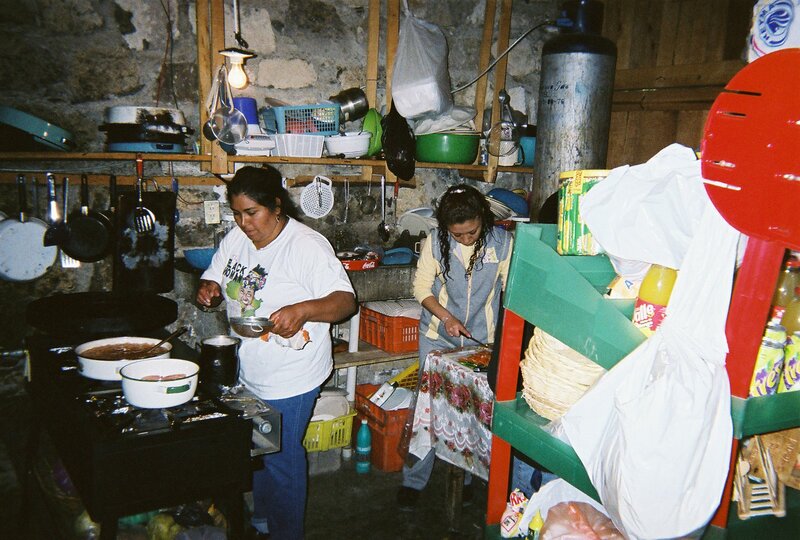 It’s a neat little community, high up on the Sierra Madre Oriental at an elevation of 5,430 feet. This is the same mountain range that runs along the Northeast Mexico and up through Big Bend National Park in Texas. Galeana is a small town nestled among the mountains just southwest of Linares and Montemorelos. We took our motorcycle route through Reynosa, Mexico and then made our way down the autopista to General Bravo. From there we jumped off the main highway and headed to China then General Teran. Motemorelos, famous for its citrus industry was next on the way and finally Linares before making our way to Galeana. Its a short distance in total, about 220 miles, but it takes a good five hours plus to finally make it there. The countryside is beautiful once you pass Linares as you begin to climb towards Galeana which lies at approximately 5,500 feet. Aramberri and Doctor Arroyo are further to the south with Iturbide to the east. Galeana is one of those small towns that's a jewel to visit. It's got great weather, small enough to where everybody is very friendly, and it's so conveniently close to the United States that it's easily a great weekend ride. That is, once the violence down there ends and its once again safe to travel. So my Mexico ride stories have become rides that we've taken in the past. What a shame that we can't ride into Mexico right now without the fear of getting assaulted, but like all things, I believe that this will pass and touring Mexico will once again be safe. Can't wait since it's such a beautiful and historic country. 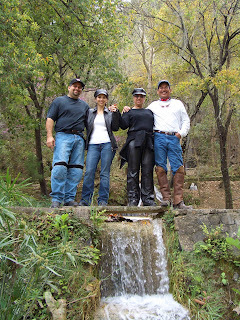 categories "BMW", "Harley Davidson Motorcycle Touring", "Mexico Motorcycle Touring", "Mexico", "Touring"
Our trip in 2006 to San Miguel de Allende was one of the best riding trips we ever took into Mexico. We met in Pharr, Texas on Hwy 281 just north of the international bridge from Reynosa, Tamaulipas, Mexico. It was almost exactly a year since our last trip into Mexico when we rode down to Real de Catorce, San Luis Potosi, Mexico on a short four day ride. Real de Catorce was at one point in time the richest silver mining town in the western hemisphere and now is a quaint tourist village whose only entrance is a one lane mile long tunnel. Word spread about the good time we had the year before and our original group of 15 was now 28 with 18 bikes (with an additional couple joining us in Cd. Valles). It was the second week in March, coinciding with Texas schools’ spring break. My wife and I awoke about 3am to finish packing and to make sure we were in Pharr, about 20 miles from our house in Mission, on time. I had plenty of time to pack the bike, check everything, and recheck. We made Pharr right at 6am. There were already about six riders there, mostly the group that came down from Corpus Christi, but within twenty minutes everyone showed up. Seems we weren’t the only ones who couldn’t sleep! After we all topped-off our tanks, said a group prayer, and had our last cup of coffee we headed out at about 6:45am, still dark, across the international bridge into Mexico. The weather was a very nice 72 degrees or so. We rode through Reynosa’s eastside and out of town headed towards the coast then south on toward San Fernando and then Cd. Victoria. Eighteen motorcycles meandering through small Mexican villages and twisty mountain roads made the going slow, but we were able to coordinate all our stops on a pretty orderly basis and after the first few times it didn’t take long for us to line up for gas at all the available pumps at the nationalized PeMex stations and move through the refueling process fairly quickly. As we got close to Cd. Victoria we shot off the main road to a small local restaurant for some good carne guisada (braised beef tips). It was good home food cooking because it was both a restaurant and residence. After lunch we rode through the outskirts of Cd. Victoria and on to Cd. Mantes. Gradually, the terrain began to change from the typical south Texas semi-arid desert to green semi-tropical surroundings. It got hot towards the end of that first day, well into the 90’s as we entered Cd. Valles. We stopped in Valles for the first night and stayed at a resort hotel named Hotel Taninul http://www.taninulhotel.com on the outskirts of town which is famous for its springs. The hotel staff was very accommodating, asking us to park our bikes under their entry veranda. For most of us, this was our first experience of traveling together in such a large group, but by natural instinct everyone went about their way, some straight to the bar, others to check in, and still others to eat. We couldn’t help notice that the hotel had a weird type of smell, not offensive, but not typical of anything. Well, we soon found out that the smell was caused by the high concentration of sulfur in the spring waters that ran right through the hotel. Cd. 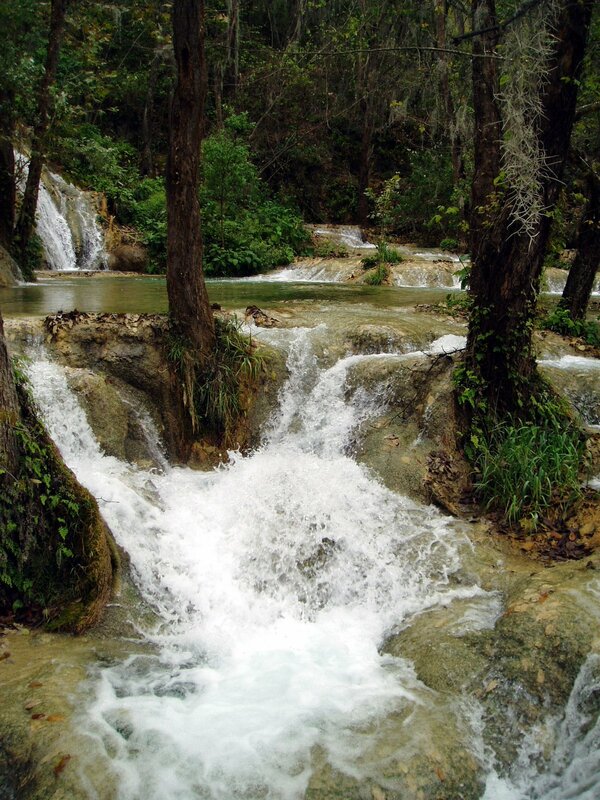 Valles gets many visitors who come to dip in the sulfur springs, long known as a therapeutic cure for body ailments. A few also discovered the metallurgic properties of sulfur on silver. It turns silver black, but as we later discovered on our trip it can be reversed. 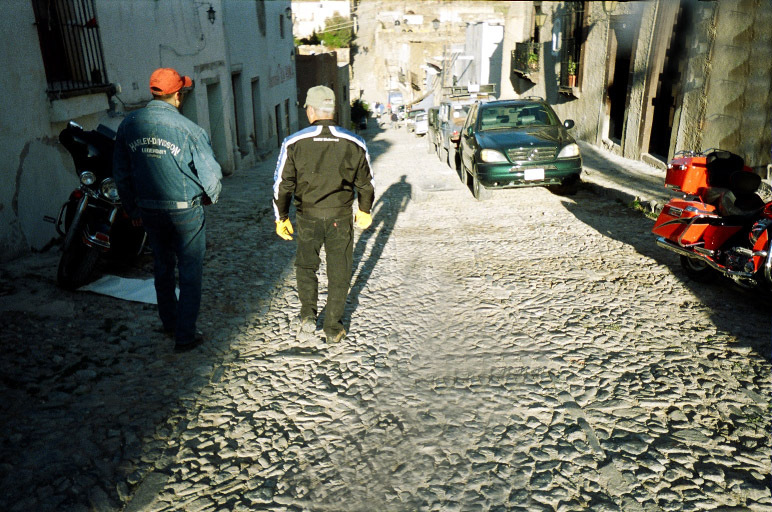 Early the next morning we all had breakfast and were joined by a couple from Tampico who would lead us on our next leg, across the mountains toward San Miguel de Allende. We left the hotel at 9am and it wasn’t very long before our semi-tropical surroundings really switched to a much more tropical look. Everything was a beautiful green and plants and trees were already blooming into beautiful colors. It also was sugar cane harvest time and we would come up on slow moving trucks loaded to several times their height with sugar cane. Needless to say, we ran over a lot of sugar cane which fell from these trucks. At first we traveled on mostly beautiful rolling hills and through green pastures. As we rode, you could see off in the distance the silhouette of low hanging clouds which slowly transformed into a mountain range. It didn’t look like there was any great passage through those mountains and we soon discovered that there isn’t any. All of us knew that the road ahead was going to be both beautiful, but challenging. There was no disappointment. The road twisted right, left, down, up, and again though some beautiful scenery. We all felt good about the ride and making it through, looking forward to moving on to our lunch stop when our guide said the road ahead is not too far from our planned lunch stop, but that it was really a twisty road, much worse than what we had just been through! He was right. I don’t know the exact mileage, either 45 to 100 miles, but it took about two and half hours. We finally got through the mountains and had a late lunch and we knew that we would have to really make some time to get to San Miguel before sunset. At one point we were within a hundred miles of Mexico City and then headed north toward San Luis Potosi. We made the outskirts of San Miguel right after sunset and entered the city at night with traffic bumper to bumper moving very slowly or not at all on steep cobble stone roads, not the best thing to be on after a very long day through the mountains and riding two up, but we made it through town to our hotel, Real de las Minas http://www.realdeminas.com about 7:30pm. San Miguel de Allende is a beautiful town with plenty to see and do. Over the years it has become quite an attraction for settled-out tourists from the United States that make it their year-round home. A cab driver told us that San Miguel was at least 45% anglo. It certainly seems to be that way. With that migration the town has adapted to a higher standard of living with very good restaurants, hotels, homes, and art galleries so you won’t find great deals for a few pesos. We stayed in San Miguel two nights so we could take our time seeing all of the attractions in the quaint town. My wife and I spend most the time walking through the historic churches, and the great market square. We ate lunch at a great Italian restaurant situated at the street end of an intersecting “Y” that gave us a wonderful view of daily life in San Miguel. We saw a local police officer writing a citation for a vehicle parked right in front of the restaurant on the sidewalk in what was an obvious “no parking” zone. He left the citation and removed the license plates and went on his way. We asked our waiter why they do that and he explained that you can’t drive around without plates and the only way to get them back is to go to the police station to pick them up where you’ll have to pay the fine. That makes sense. We watched as six of our bike group roared by on rented ATVs, and just people reading and going about their business in San Miguel de Allende. At night there was good number of us at the Harley Bar. The proprietor, a young man who looked like he could have belonged to the WWC federation, served up drinks to all as he traded Harley stories with anyone wanting to listen. He had his “black beauty” parked right outside his bar and he would start it up and tell us how he crossed the United States at least twice on that bike, one of three he owned. Before the night was over one of our group had commandeered the mike and was singing well into the night. We left San Miguel at seven in the morning and headed back up north and eventually northeast toward Cd. Victoria. We went through quite a bit of highway under construction and it slowed us down, but we made Cd. Victoria by day’s end. We stayed right down town on the plaza square at a Hampton Inn and had a great view of the plaza. Our bikes were parked in the basement garage and we had a great evening relaxing and talking about the trip. Our fifth and last day we left Cd. Victoria at 9am and headed north on the same highway we first took Saturday morning. We made it back to the United States by 3pm and we all headed straight to the closest What-A-Burger in Alamo for our favorite staple, hamburger and fries. We traveled 1,300 miles in five days. categories "Harley Davidson Motorcycle Touring", "Harley Davidson", "Mexico Motorcycle Touring", "Mexico", "Touring", "motorcycle touring"
Veracruz, Mexico is one of the most beautiful cities in Mexico and its Caribbean, African, and Spanish influences port are undeniable especially in its architecture and foods. It's Mexico's oldest sea port having first served as a port of entry since 1518 making it about 500 years old; more than double the age of our country's independence. Taking a fairing direct route, Veracruz is about 650 miles from the Texas border (Mission, Texas). Twenty four of us set out for this seven day trip and for the first time we had a couple follow in a suburban which added a degree of security in case we broke down or had an accident, neither of which occurred. It's funny to note that all of us had our bikes packed perfectly, but once we had the luxury of the Suburban it quickly got filled with bags and paraphernalia that made us realize just how much stuff we load our bikes with. Rest Stop - Just Follow that Beer Truck! One of our group leaders had shirts made up for all of us which read, El Chorrito Club, commemorating one of our first rides into Mexico when two of our group dropped their bikes as they stalled out on a sharp narrow turning incline as we headed to El Chorrito, Hidalgo, Tamaulipas, Mexico. Our group was so large that routine gas stops and meal breaks usually turned out to be a good minimum half hour for gas and about two hours for lunch, but that didn't seem to bother any of us as we were having a good time. For lunch breaks we'd try and find something out of the ordinary where they could handle a large group. South of the Tropic of Cancer that the landscape started to change a little bit, but it was not until we were well south of Tampico that the vegetation really went from dry semi-arid conditions to lush vegetation. Our first night was spent in Tampico in a downtown hotel which made it convenient for us to leave the bikes parked while we hunted down a good restaurant or bar. Tampico founded in the early 1800's is another port city which is very industrialized and carries tons of commercial traffic inland to Mexico's major cities. We were off early the next morning and headed to our next stop, Tecolutla. Tecolutla is a small village on the Gulf Coast which serves as a big tourist village mostly to local Mexican nationals since it is the closest beach to Mexico City. It's a real jewel, hidden away from all major traffic it serves as a must stop for anybody wanting to really see something special. The Tecolutla River discovered in 1518 pours into the Gulf of Mexico. We happened onto Tecolutla on a Saturday and they were holding an annual festival so everybody was out on their main streets strolling up and down. We were really fortunate to be there and participate in the festivities. We wandered through the streets trying to decide where to stop for a beer or dinner...too many choices. One of us, as I discovered later that evening, followed a young boy carrying a huge lobster as he made his way to a tiny restaurant. Our rider quickly said that he wanted "that" lobster for dinner! You won't see that too often on our US streets. Our hotel had a secure fenced parking area where we kept our bikes and a young man washed our bikes for just a few pesos while we took in the town. The next day we took a slight detour from our journey south along the coast as we headed West about thirty miles to the archaeological site of El Tajin. It's an ancient city with pyramids, buildings with bas-reliefs carved into its stone walls, and game courtyards where losers were beheaded. The carved reliefs tell a very interesting story on their culture, games, rituals, battle enemy's being decapitated, and social life. Although it was out of our way, it was certainly a worthwhile detour. It's hard to imagine that just a few hundred miles South of our border there are archaeological findings that long pre-date the discover of America. Our visit to El Tajin was only half day before continuing our journey down to Veracruz. The highway south of Tampico leaves a lot to be desired and it's probably some of the poorest highway since being so close to the coast it gets battered by coastal winds and moisture year-round. We hugged the coast as we stayed on the Poza Rica - Veracruz Highway (Mexico 180). Other than the condition of the road in spots the ocean views, the tropical vegetation and sea breeze made this ride one of our most memorable. It was a long ride into Veracruz and ended up rolling into town after sunset. We finally settled on a hotel along the Costa Verde vicinity, checked in, and made our way across the street to a nice seafood restaurant. It wasn't until daylight and riding into downtown that we discovered what a beautiful city we had landed onto. It's an old city with much history and it architecture is beautiful. We went by the port where huge ships were docked and they were busy either getting loaded or unloaded and headed to unknown destinations. Of course, a prerequisite of any Veracruz trip is a visit to the historical Gran Cafe de la Parroquia where clicking your glass with a spoon sends over a waiter to pour milk into your coffee. In my opinion, it's a must visit, but it's not for the food, just for the coffee and for the fact that it's more than a restaurant, it's more of an institution in Veracruz. After your coffee we walked the streets and dropping into the markets along the docks to check out the tourist things. That evening we asked a waiter at a "nice" touristy restaurant for a recommendation and he quickly told us that after his shift was over he headed over to a little side street restaurant where he worked another shift, but swore by the food. We took his recommendations and we were not disappointed. Seems most good restaurants like the one we visited has fresh seafood and can fix it just about any way you want. Of course, I had the Huachinango a la Veracruzano (red snapper) that was great. On our last day in Veracruz we spent most of the day in the main downtown plaza. All of us had a great time as we drank, listened to music, and just kicked back and enjoyed good food, drink, and music with good friends. We took a few days getting back to Texas riding straight from Veracruz to Cd Victoria for an overnight stay and then back into Texas the following day. Veracruz is one of the southernmost rides we have taken into Mexico, but it was a great ride along the Gulf coast. Once things settle down in Mexico we'll point our bikes in that direction again. categories "Harley Davidson Motorcycle Touring", "Mexico Motorcycle Touring", "Mexico", "Touring"
This is the 1938 Brough Superior Model "SS80"
A few miles north of lonely Vanderpool, Texas nestled just off of Highway 187 North and surrounded by the Texas Hill Country you'll find the Lone Star Motorcycle Museum The bike pictured above is the same model bike that Lawrence of Arabia, TE Lawrence, was riding when he suffered a head injury after losing control of his bike while attempting to avoid some children riding bicycles. A motorcycle museum situated in the Texas hill country doesn't make much sense until you consider all the bike riding that takes place in the hill country then I guess its not a bad place to be. Come springtime there's always a slow, but steady stream of bikers that stop-by to check out the bikes on display in the museum. The museum is open from March to November on Friday, Saturday and Sunday so it's closed for the winter season. There's a $5.00 entry fee which seems high for anything out in the middle of nowhere, but it's well worth the money once you see the bikes on display. If you eat there you can get in for free, but I've never been too crazy about their food so I just pay the entry fee. They have over 50 motorcycles from all models and years. You'll see Ducati to BMW bikes from vintage years as well as everything else. So next time you're riding in the Three Sisters area take time to make a side trip to Vanderpool and visit the Lone Star Motorcycle Museum. You won't be disappointed. categories "Harley Davidson Motorcycle Touring", "Mexico Motorcycle Touring", "Touring"
Saturday was a cool cloudy day and perfect for a nice day ride. We rode out at 6am for breakfast in San Isidrio and from there we kept going north on Hwy 16 just before Loop 1604 in San Antonio and then headed east around Loop 1604 to Adkins, Texas which is between I10 East (Houston) and Hwy 87. Texas Pride http://www.texaspridebbq.net is a nostalgic trip in time if you're of age to remember things from the 50's or so. In the 60's I worked at a Sinclair gasoline wholesale distributer so it was neat to see all the old Sinclair signs and gas pumps. Most the pumps read between 19 Cents and 24 Cents per gallon. Aside from all the antiques the BBQ is really good. We each had some type of Monster Sandwich for $8, two toasted buns loaded with pork ribs without the bone and brisket. Looked like about 3/4 of a pound of meat which can easily be shared by two. The sandwich and a large tea cost $11.02 which is pricy, but you get a lot of sandwich for that price. The guy behind the counter said that there's an even bigger sandwich, but we didn't go there. That same guy mentioned that we should drop by on Thursday, bike night. According to him there's over 500 bikers every Thursday. They have live music in the pavilion area behind the restaurant as well as a special parking area for motorcycles and a motorcycle shop. The shop was closed, but it looks like they sell lots of after market stuff. It's worth a return trip just to check it out. After lunch we slowly made it back to the valley via Karnes City and Kenedy. Kenedy, like most rural towns in Southwest and West Texas is overrun by oil riggers working on Oil Fracking. Seems like each small town from Hebbronville, to Freer, Jourdanton, Kenedy, and everything in-between is overrun by big Tractor Trailers loaded with pipes or other oil drilling rigs. That means lots of mud on parts of the highway. Temporary RV parks just pop up over night and it seems like each little town has a hotel or motel under construction. So towns like Kenedy no longer just have prisons as their major industry, now its prisons and rough necking. We spent about 15 minutes in Kenedy talking with a guy that had a Kawasaki motorcycle made up to look like an Indian Motorcycle. He was really proud of it and mentioned that he had owned it all of three hours. We rode approximately 520 miles on a beautiful cloudy day with temps in the high 60s and 70s. A great ride with great BBQ. categories "BMW", "Harley Davidson Motorcycle Touring", "Mexico Motorcycle Touring"
At least two or three times a year, if not more often, we make our way to Luling, Texas either as a destination ride or passing through as we take the back roads to Austin. If you couldn't see Luling you can sure get the heavy smell of crude oil as you roll into town. Luling is at the intersection of Hwy 90 and 183 and is approximately 50 miles Southeast of Austin. Founded in 1874, Luling was known as a rowdy town for cattle drivers on the Chisholm Trail, but became most famous for its oil production in the 1920's. At one time Luling produced over 10 million barrels of oil per year. That's still evident today as you pass through town seeing several oil rigs still pumping. There's one right at the heart of town right across the Central Market BBQ. BBQ is the reason we stop. City Market Barbecue is a rustic, old fashioned restaurant that is packed with locals so you know it has to be good. Once inside, at the far end there's another small room where you enter through one door to order. That's the room where the pits are and it is hot. The signs on the wall in the pit area are all pretty well covered with years of soot, but you can still make out what's available. Half a pound of brisket, a slab of pork ribs, and a jalapeno sausage link is more than enough for two. Everything is placed on several layers of butcher paper along with as many slices of bread as you care for. Pay, exit through other door, and make your way to the drink counter to order your "Big Red" before finding a place on any available picnic type table. June is a good month to visit during the annual watermelon thump. It's still pleasant riding weather in June and makes for a great one day ride. Can't beat BBQ, watermelon, and strolling around downtown to check out what the local merchants have for sale. If you're looking for a one day ride to somewhere other than the hill country think about making a stop in Luling, Texas. You won't regret it. 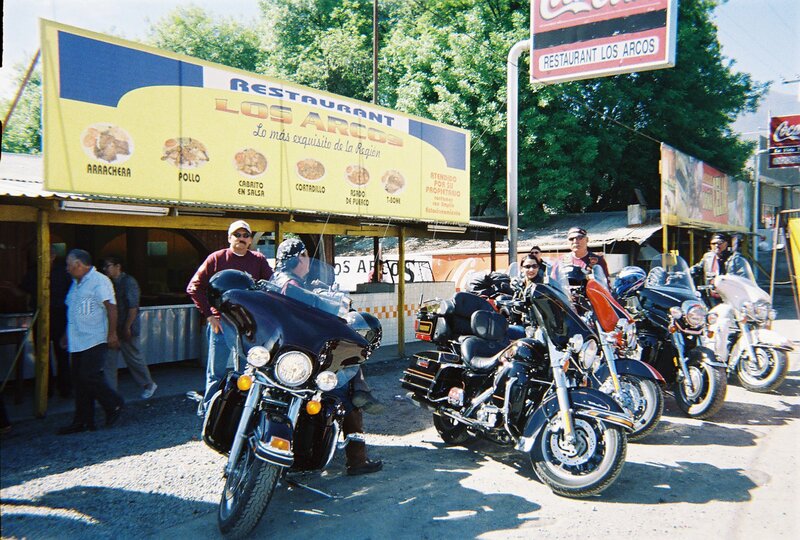 categories "Harley Davidson Motorcycle Touring", "Mexico Motorcycle Touring"
Back when it was safe to travel in Mexico we rode to El Salto known as "Velo de la Novia" (bridal veil) is located in Zaragoza, NL, Mexico. It's off the main roads, but a unique area to visit while touring in Mexico. We made our way into Mexico in Reynosa and stayed on the autopista (expressway toll road) down to the China exit then took the less traveled roads to Montemorelos, Linares, Galenana, Doctor Arroyo, and finally Zaragoza. It was a misty afternoon on our arrival and the cobblestone roads can get slippery, but we managed them well enough to stay a while and enjoy the waterfalls. We arrived after lunch, but by mid-afternoon the kitchen opened for business. Pulling fresh trout from holding tanks somewhere above the park area we were treated to feast for just a few dollars. If you're ever in this area be sure and make time to see the waterfalls and be sure and get some great trout for lunch. categories "Mexico Motorcycle Touring", "Mexico", "Touring", "Wildlife Refuge"
Fred Arellano of the Rio Grande Valley who is very familiar with travel into Mexico organized the Los Tejanos Bike Group for a friendly ride into Mexico last week. As team leader Fred did an outstanding job of preparing us for the trip by arranging everything ahead of schedule including a group insurance discount rate for our motorcycles. Everyone had the responsibility of getting their proper visas and vehicle permits. Getting our paperwork in order required spending anywhere from an hour to several hours at one of the border towns. Most of us went on a weekend to Nuevo Progresso, south of Weslaco, since the lines are short and people are friendlier in a small town. Helping organize the event were Ruben Villarreal and Jaime Villarreal. They even had shirts for all of us to use; blue shirts on the first day and maroon on the last day. The shirts certainly helped clear the way for us as we were never stopped for any inspections throughout the entire trip. The trip started early March 10th at the rally point of Fernando’s Restaurant in Pharr, Texas. Our group was made up of 16; seven couples were riding two-up and two solo riders. Most of the riders were from the Mission, McAllen, Pharr area, but one couple joined us from Corpus Christi, Texas. We crossed at the Pharr International Bridge (next to McAllen in the Lower Rio Grande Valley) into Reynosa and took the Autopista (Mexican Toll Road) to Gen. Teran. Leaving the autopista going on the public (toll free) road, we traveled through China, Montemorelos, Linares and Hidalgo all of which are north and then southeast of Monterrey. Our first destination was El Choritto, a small village south of Linares and close to Cd. Victoria. 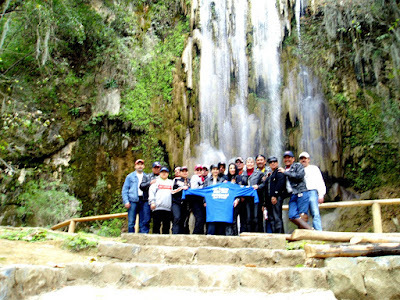 Its fame comes from a small waterfall (La Virgen del Chorrito) for which the village gets its namesake. 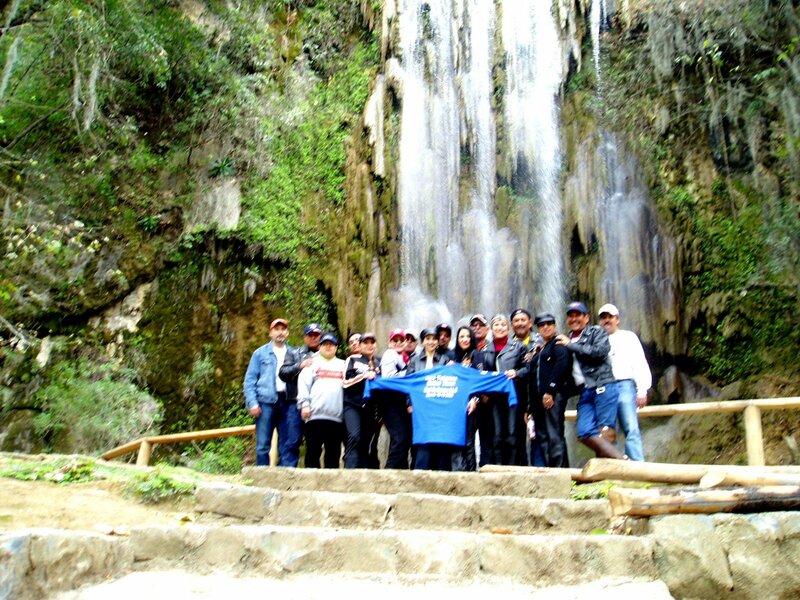 El Chorrito waterfall is beautiful and so is its majestic mountain view overlooking the lake it fills. 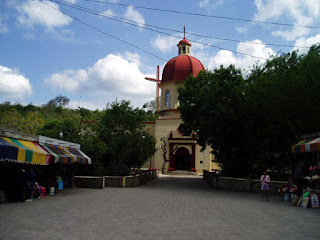 We stopped at El Chorrito for a late lunch, enjoyed some of the local attractions such as the church which is part cave and part structure. After lunch, we made our way back towards Linares and then headed west toward Iturbide and on to Galeana which is high in the Sierra. It’s only about 75 kilometers from Linares, but it is all twists and climbs. It’s a fun road to drive and as challenging as anything you can find in Texas. Thirteen hours after we left Pharr we arrived in Galeana. It was already nightfall and we were all glad to get that first day out of the way. We found a local restaurant for dinner and then just milled around the plaza. Some of the group found a trio and sang their way into the night. What a great day! We awoke the next morning to see that we were surrounded by mountains in the beautiful little city of Galeana. 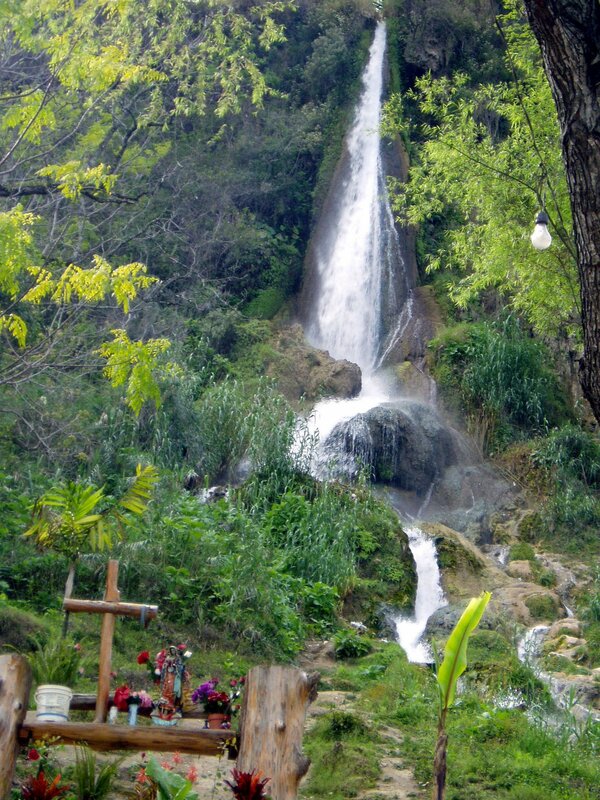 We got on the road by 10am, leaving Galeana and headed south down Highway 61 to our next destination, Zaragoza where on the outskirts of town is the famous "El Velo de la Novia" (veil of the bride) waterfall. The road to the waterfall is also a climb and twisty, but well worth the trip. Once there we relaxed and eventually got to eat some great tank farm trout. There were some ladies who run a small convenience store and kitchen who prepared eight broiled and eight deep fried trout for us. Best tasting trout you’ll find anywhere. We had too much to eat and got a late departure to our next destination. Real de Catorce was our destination, but it was quite a ways away. We would have to go to Dr. Arroyo and Matehuala before heading to Catorce. As it was, we ended up in Matehuala at nightfall with another 75 kilometers or so to go. Real de Catorce is now a famous little village, high up in the desert at an elevation of 9,000 feet, most famous for the filming of "The Mexican" with Julia Roberts and Brad Pit. It's no place for our big road bikes though since the last 21 kilometers (13 miles) are an old cobblestone road which works wonders on the bike and body. The last 1.2 mile entrance into the village is an amazing one lane tunnel which goes through a mountain to the village. The cobblestone road into Catorce seemed like a boulevard compared to the very rough route to our hotel once in the village. We rode in so late that we didn't know that we were suppose to make sure we had a green light before entering the one-lane tunnel. Luckily for us it was late enough that there was no out bound traffic. Once inside Real we realized that the street elevations were no exactly TxDot Highway standards. Some inclines were insane for anyone to handle on a bike. We were so tired that it didn't really bother us, we just wanted to settle in for the night. Our ride required two hairpin turns onto very narrow cobblestone streets with a very, very steep elevations. When we looked at those turns and climb the next day in daylight, all of us wondered how we made it, so in a way, it was a good thing it was dark and we didn't know what we were doing! Parking our bikes was another experience since it was practically impossible to find any flat spot along the road. We parked bike on precarious inclines, left them in low gear, and jammed rocks behind the wheels to keep them from sliding backwards. 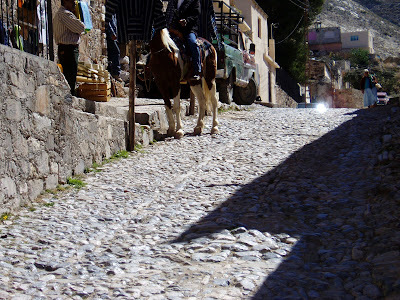 Catorce is a very neat little village, with plenty to do and see. After we settled in we had a wonderful dinner at one of the many hotels and we were welcomed by the BMW Club of Mexico City who were holding an annual rally in Catorce. We met two riders from Texas (San Antonio and Dallas) who rode up to join the Mexico City Club. After dinner we spent hours in the hotel lobby introducing ourselves to a bottle of “El Cabrito Reposado” tequila and talking about our trip. Our hotel was high up in the village (even much higher than the BMW club members who were all on motocross bikes) so we decided that in order not to endanger anyone, the women would take a leisurely ride on horseback through the village and down to the tunnel entrance. As it turned out, that was a smart move because it was a job getting our bikes down to that level. Early Saturday morning a group of five (three bikes) had to leave to meet prior commitments back home. That left eleven of us at Catorce for a later departure. Pine Trees - Must be going Up! Safe way down from Hotel! It looks a lot smoother than it really is. Notice the rocks we used to keep the bikes from sliding down the road! Local native, the one on the right. The girls took the safe way down to the tunnel, on horseback! We left Catorce about noon now with Jaime Villarreal in charge of the group. Once we made it to the highway we all felt like we were riding on glass, so smooth and peaceful compared to the cobblestone road. We decided to make a hard push to the outskirts of Monterrey. We passed Allende and stayed in motel in Santiago. We all had a good dinner and rose early at 7:30am to prepare for the ride home. We traveled a few miles more towards Monterrey and stopped at Los Cavazos which can best be described as a Taco Row of eating establishments. We found one which had breakfast plates and then took a side road to Cadereyta. From Cadereyta we were back on the autopista toward Reynosa and home to Pharr. We made it back to the US about 4pm on Sunday afternoon. I think most of us agree that this was the trip of a lifetime. We certainly challenged ourselves and our bikes in more than a few situations so it made for memorable story telling. Probably the most consistent obstacle we faced at every city, community, and village are those infamous topes (speed bumps) which are used to regulate speed as you enter and travel within town. They certainly have eaten more than one rear axle from someone going a bit too fast. The bikes generally did fine, but we sure got more than our share of scrapes on those topes. We drove four days, stayed three nights, and logged 1,027 miles on the trip. It’s not too many miles until you consider that many of them had to be taken between 20 and 30 miles per hour. A short 225 mile ride turned out to be a thirteen hour day. We drove each day into the night and dedicated most of the trip to riding instead of sightseeing. Of course, the greatest result of our trip was the bonding of friendships made on the trip. Some of us knew very few of the riders when we started out, but by Sunday we were fast friends who had shared a rare and exciting experience. Those are the friendships of a lifetime. I don’t know that any of us would do it again! Of course, we’re already planning our next trip into beautiful Mexico. It’s amazing that just a couple of hours south of us we have hills, mountains, and a friendly nation ready to welcome us. You can’t beat that! Mexico is a beautiful country which offers just about any challenge you’re ready for.